Udaipur, city of lakes, an oasis in the arid wastes of Rajasthan, a sweet dream where majestic palaces are reflected in sparkling water. 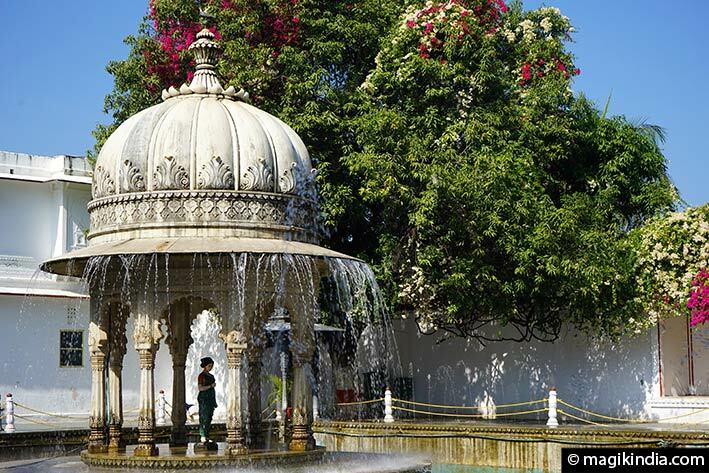 Yes, Udaipur is certainly one of India’s most romantic towns. 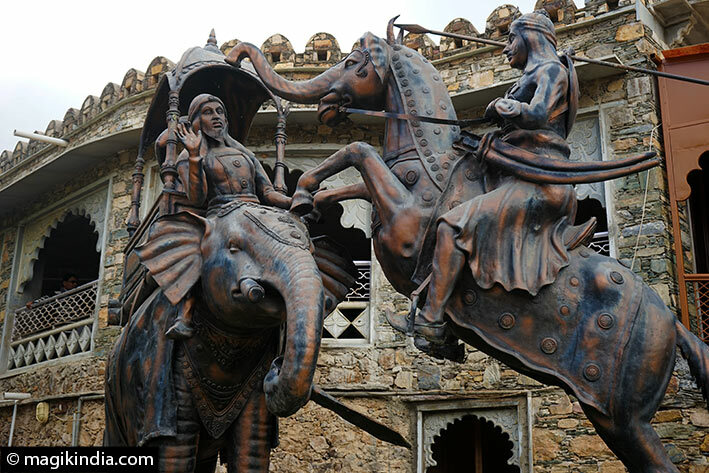 Udaipur was the capital of the Mewar kingdom, which covered what is now south and central Rajasthan. It was founded in 1553 by Maharana Udai Singh II, who had fled Chittorgarh, the former capital, when the Mughals captured it. This city owns its name from its beautiful lakes and watercourses. Lake Pichola, Udai Sagar Lake, Fateh Sagar Lake, Rajsamand Lake and Jaisamand Lake are the five prominent lakes of Udaipur. Udaipur, with its picturesque landscape and historic palaces and architecture, is a major destination for most tourists, both domestic and foreign nationals. 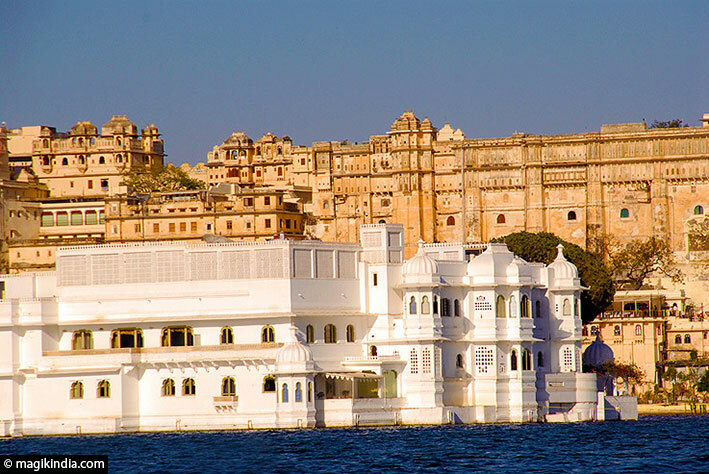 Udaipur is home to some of the world’s most renowned and the country’s best luxury hotels and resorts, The Taj Lake Palace on Pichola lake is one of them. Countless films have also been shot here, from Bollywood romances to James Bond. Mewar festival is observed to welcome the arrival of spring season. 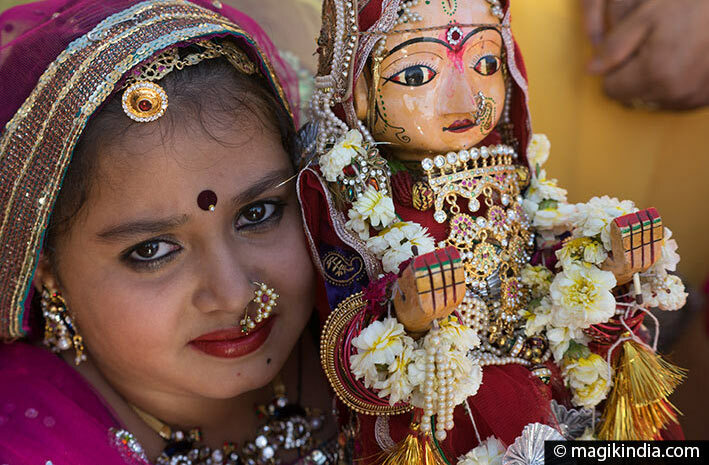 Coinciding with the Gangaur festival, Mewar festival is equally significant for the womenfolk of Rajasthan. When this religious part gets over, people engage into various dances, songs and other cultural events revealing the culture of Rajasthan. This chariot festival originated in Puri (Odisha) and is dedicated to the hindu god Krishna. 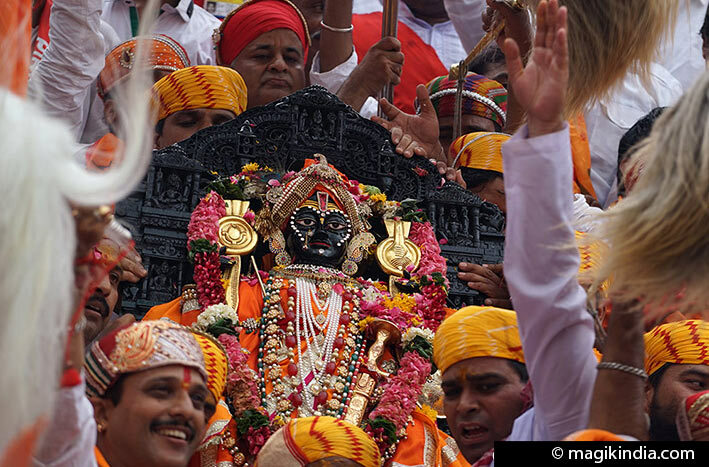 Udaipur holds the distinction of holding the 3rd largest Rath Yatra in India. On this day thousands of devotees accompany the procession of the chariot boasting the idol of the Jagadish temple. 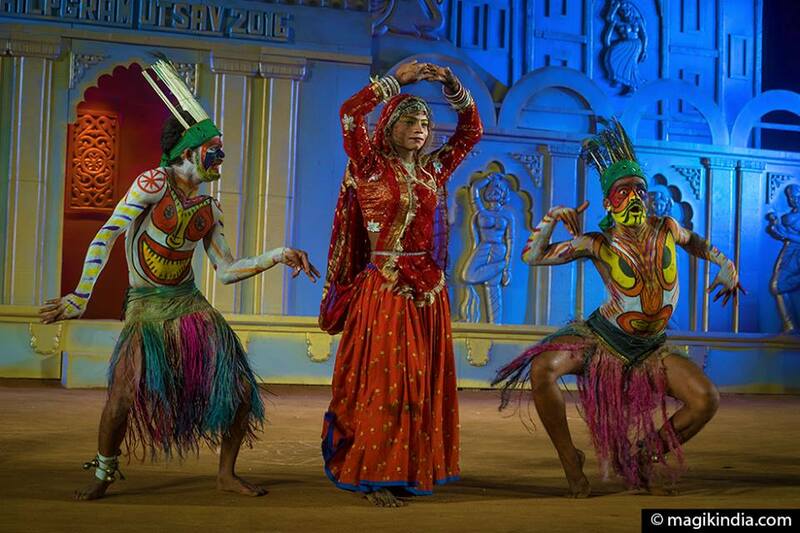 Cultural programmes, dances and music about Krishna’s life are held too in front of the temple. 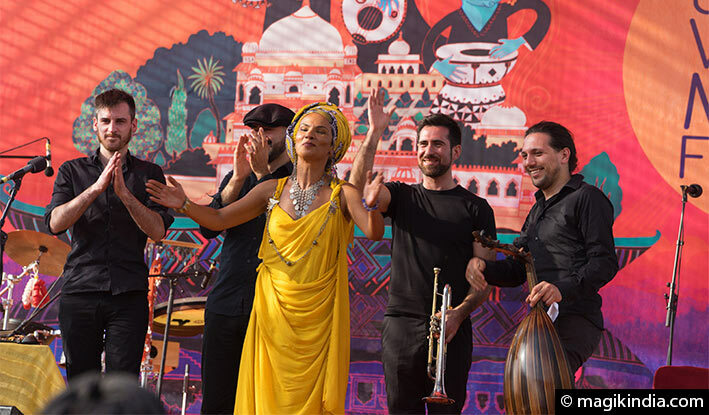 Udaipur comes alive with this two-day festival hold in February who brings together over 100 global artistes and ensembles from all over the world (Spain, Ghana, Venezuela, Italy, France… as well as India). The aim of the festival is to establish an annual signature event in Rajasthan and at the same time establish Udaipur as a major destination for world music in South Asia. 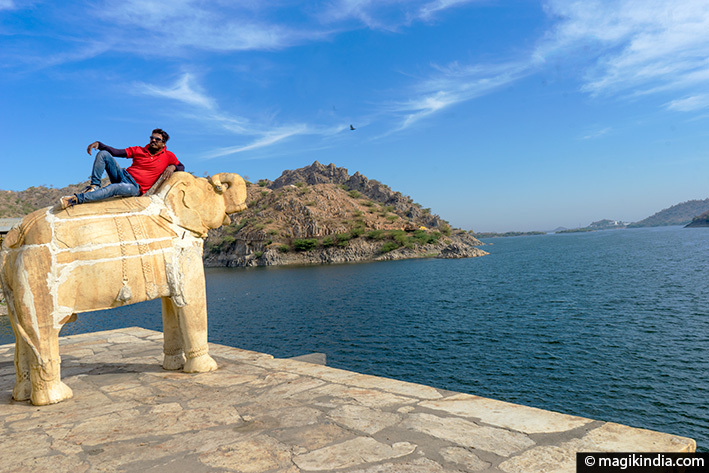 Udaipur is the well-named city of lakes so let’s start with the most gorgeous of them, Pichola Lake. 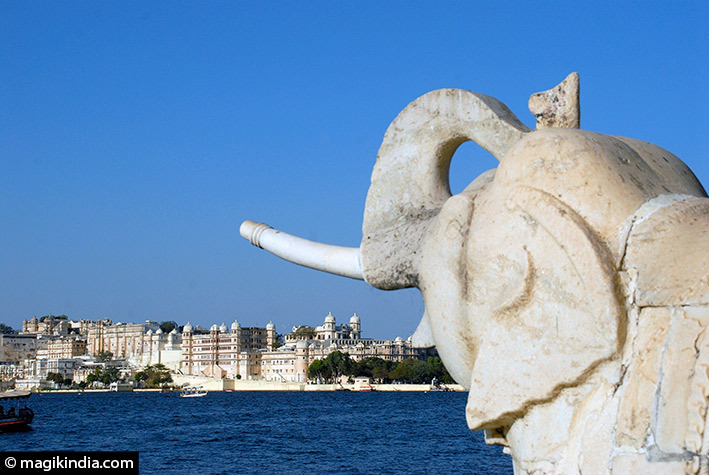 Located in the heart of the city, Pichola Lake is the oldest and one of the largest lakes of Udaipur. It was built in 1362 by Pichhu Banjara during the ruling period of Maharana Lakha. another palace that seems to float on the water. 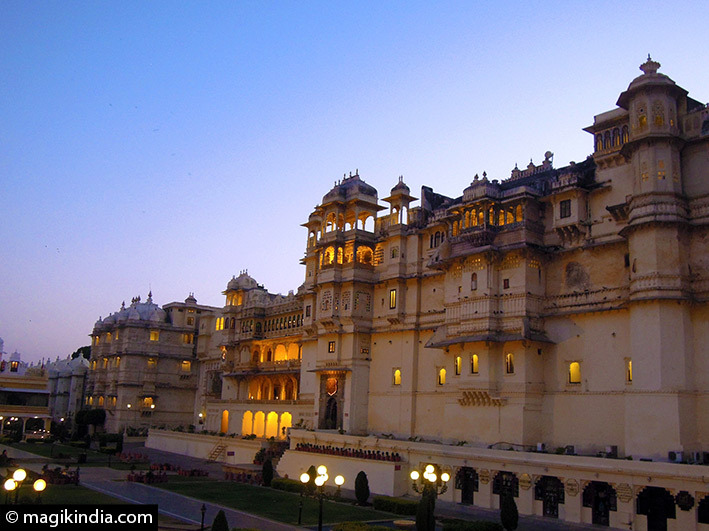 It was constructed by three Maharanas of the Mewar kingdom. The construction started in 1551, and got completed by 1652. Formerly used as the royal family’s summer palace, it now hosts chic functions and receptions. Boat trips on the lake make a halt here. 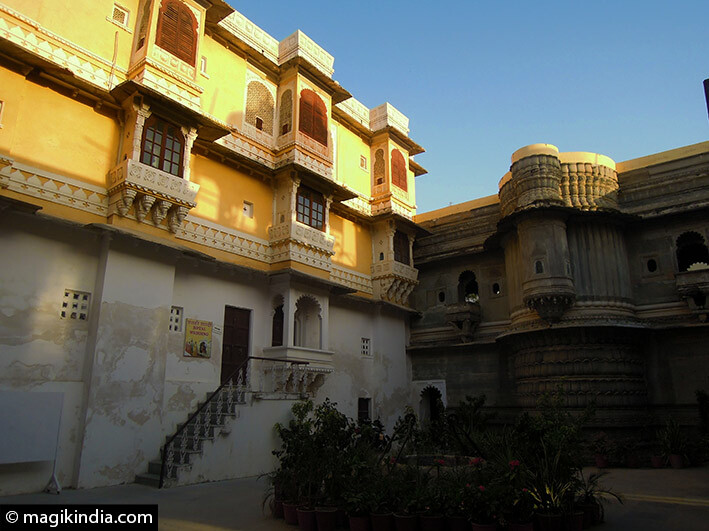 The City Palace is a vast complex of eleven smaller palaces, begun in 1559 by the Maharana Udai Singh. He established his main residence there after fleeing Chittorgarh, which had been captured by the Mughals. 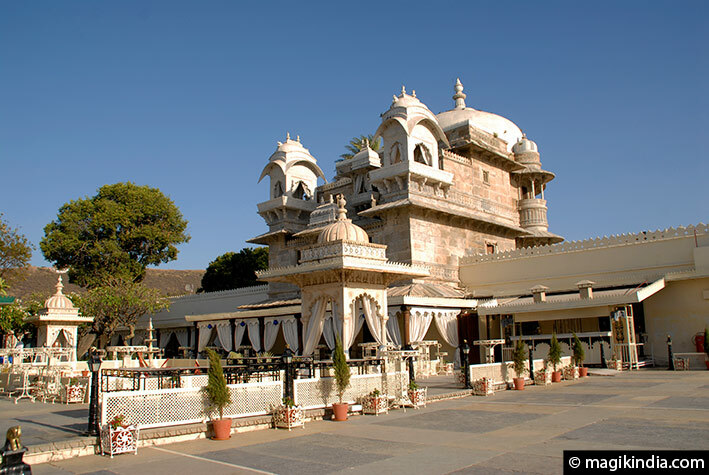 Built on a rise beside Pichola Lake, it is in a fusion of the Rajput and Mughal architectural styles. Each descendant added extensions or embellishments. Today the City Palace complex is 250m long, some 30m high and absolutely magnificent. 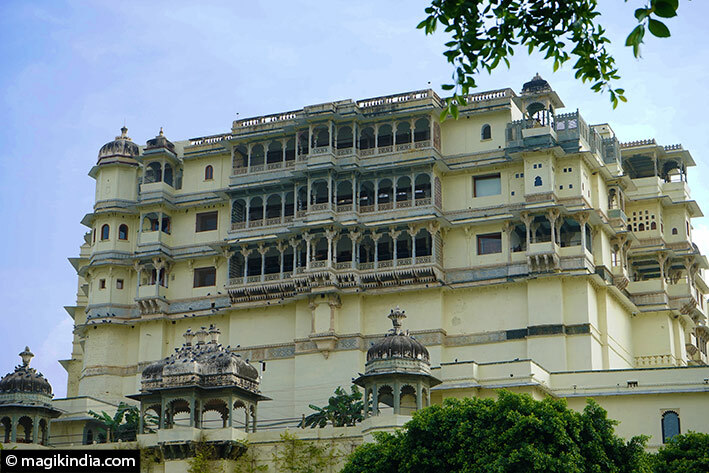 Part of the palace is the home of the current Maharana and his family. Another part has been converted into a luxury hotel, and the third part is a museum. Every evening you can see a son et lumière show retracing the history of the Mewar kingdom. Further along the bank below the palace there is a jetty where you can embark for a boat trip on Pichola Lake. Udaipur’s biggest temple located on a hill in the City Palace complex of Udaipur. 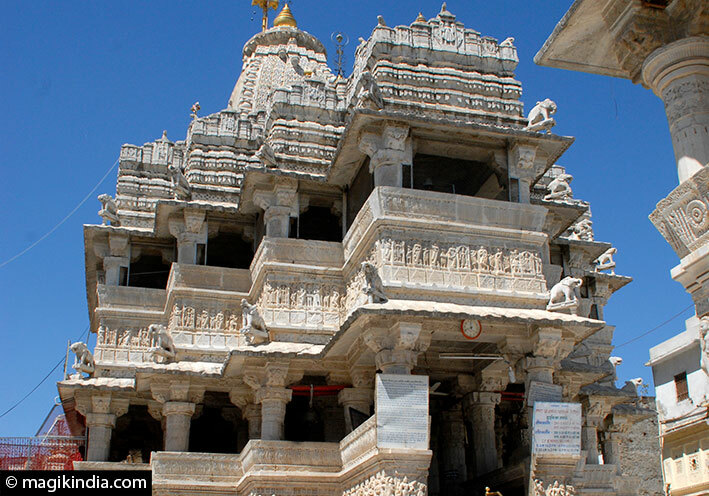 This hindu temple is made in the Indo-Aryan style of architecture and has delicate carvings. It was built by Maharana Jagat Singh in 1651 and it is dedicated to Jagannatha, one of the forms of Vishnu. 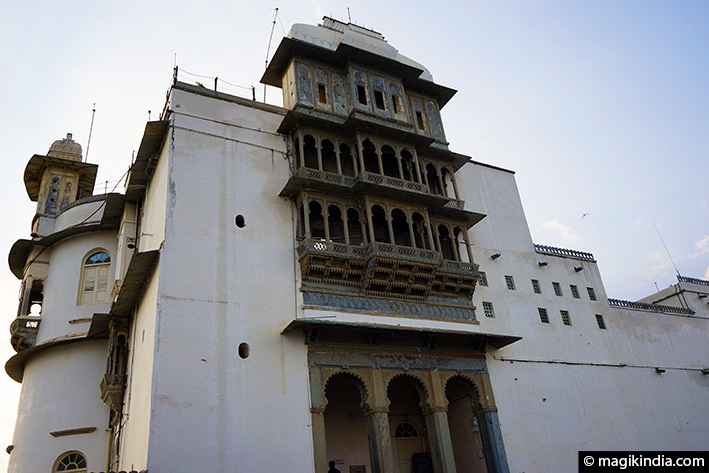 This 138-room haveli (mansion) that stands on the platform of the Gangori Ghat was built by Amir Chand Badwa, prime minister at the Mewar royal court. It is now a museum and also puts on performances of traditional Rajasthani dance and music every evening like Kathputli (traditional art of puppetry). 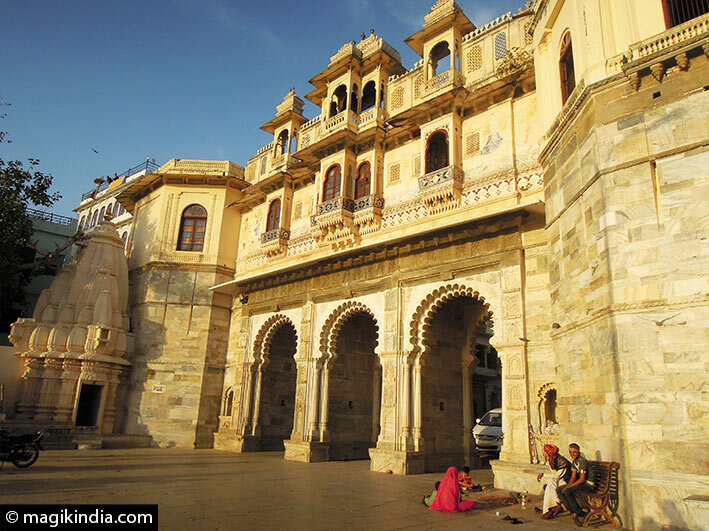 Udaipur is a particularly pleasant town to stroll around. The main sights are all in the old town. You can start early in the morning by the ghats where local people are performing their religious rituals. Start at Gangaur ghat near Bangore Ki Haveli, then cross Chand Pole Puliya bridge. Stop at Hanuman ghat where there is a fine old temple to the monkey god Hanuman and walk on to the tip of Ambrai ghat for one of the finest panoramic views of the town. Head back the way you came and lose yourself among the narrow streets of the old town, in Jagdish Chowk by Jagdish temple and around the clock tower (Ghantaghar): Bada Bazaar street, Maladas street and Hati Pole street. This is where you’ll find the old-style shops and traders – authentic India in a nutshell. Sajjan Niwas is a lovely garden at the entrance to the town, near the City Palace. 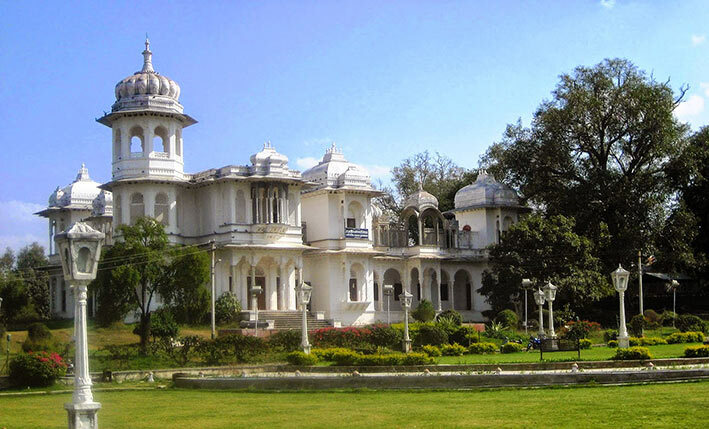 It was started by Maharana Sajjan Singh in 1850 and is a favourite haunt of Udaipur people (and me too!) for morning walks or yoga sessions. At over 100 acres it is the largest garden in Rajasthan, with a wide variety of tropical trees and flowers. It is also called ‘Gulab Bagh’ because of its rose collection. It also boasts a small zoo, several Hindu temples, the dargah (tomb) of the Sufi saint Hazrat Shakir Ali Shah, a library that looks like a palace and an astrological garden with studded paving stones that have a kind of acupuncture effect on the feet. A kilometre from the centre you’ll find a cable car to take you to the hilltop where the small Kali temple stands. 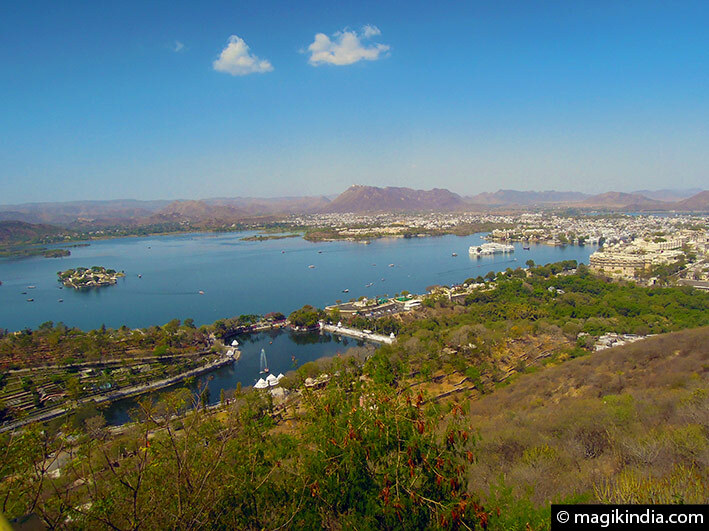 From there, the view on Udaipur city is absolutely splendid. 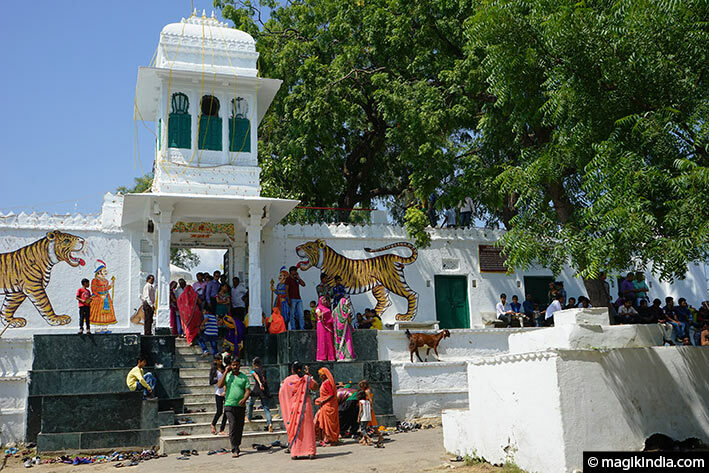 One of Udaipur’s main temples, dedicated to the Hindu goddess Durga. It is said that the Raj Singh, Maharana of Udaipur, had serious eye trouble for which he could find no treatment. 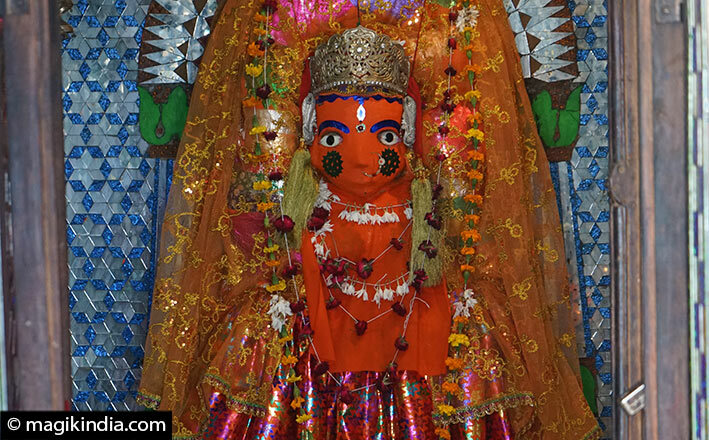 One night the goddess Amba appeared to him in a dream, telling him to build a temple at a precise spot in Udaipur. The next day the Maharana visited the place and there found a statue of Amba Mata; he started building a temple straight away and very soon his eye trouble cleared up. Every year at Navaratri a procession leaves Jagdish temple in the old town centre and wends its way to Amba Mata (see video below). 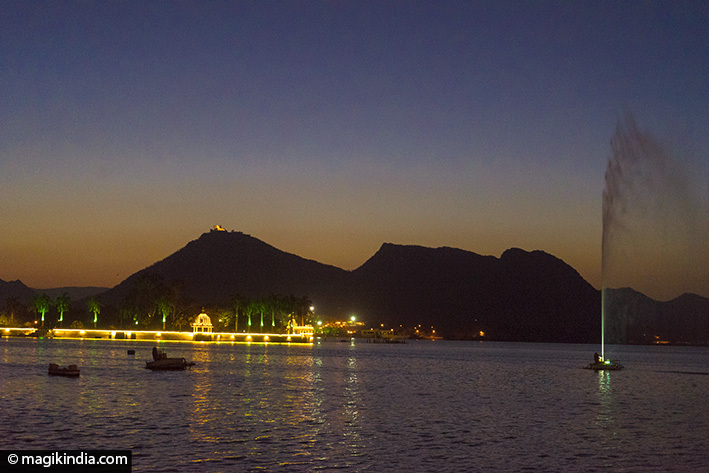 Fateh Sagar Lake is located in the north of Lake Pichola and it is one of the favorite spots for Udaipur dwellers to lighten up. Fateh Sagar Lake was built in 1678 by Maharana Jai Singh, Fateh Sagar Lake got its name from Maharana Fateh Singh, who later made additions to it. Fateh Sagar Lake is embellished by three small islands, which can be reached by taking a boat ride in the lake. The largest island of the lake is developed into a park by the name of Nehru Park. The second island is converted into a public park with a water-jet fountains. The third island addresses Udaipur Solar Observatory. Jiyan Sagar is another striking lake, located in the village of Badi. Built by Maharana Raj Singh, Jiyan Sagar was built to deal with the problem of famine in the area. The lake was named after Jana Devi, mother of Raj Singh. Jiyan Sagar also adores three chattris (cenotaphs) and a lovely embankment (ghats). Jaisamand Lake is renowned for being the second largest artificial lake in Asia. 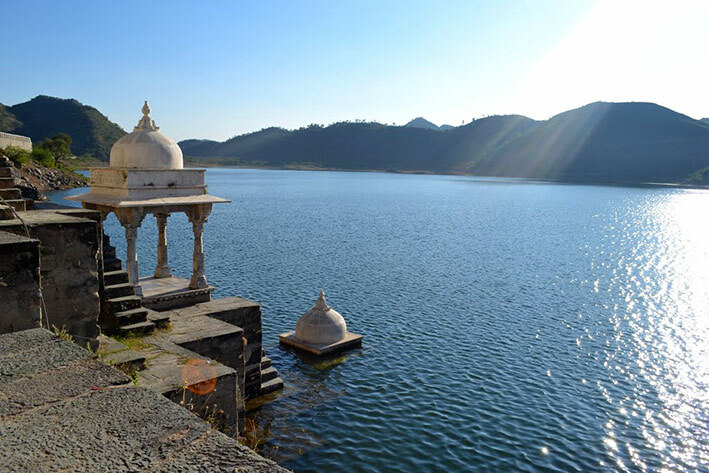 Located at a distance of 48 kms from the city of Udaipur, Jaisamand Lake is also known as Dhebar. In 1685, Maharana Jai Singh built this lake while making a dam on the Gomti River. In total, this lake comprises seven islands and one of the islands is still inhabited by the tribe of Bhil Minas. Moti Magri or Pearl Hill overlooks the Fateh Sagar Lake. 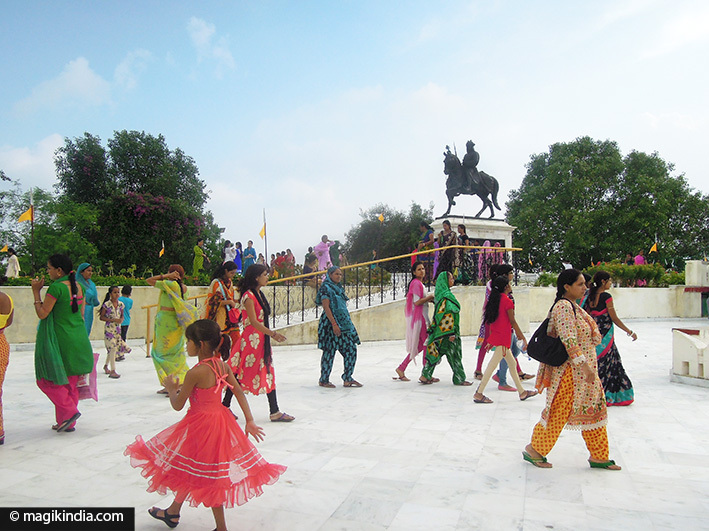 Situated at the top of the Hill is the memorial of the Rajput hero Maharana Pratap which has a bronze statue of the Maharana astride his favourite horse “Chetak”. It is believed that Chetak was a faithful horse. He was extremely protective towards Maharana Pratap and stood by his master till his last breath. Chetak was killed in the battle of Haldighati. The Memorial is surrounded by gardens and fountains, which offer a delightful walk. This lovely garden located on the banks of Fateh Sagar Lake with its fountains and white marble pavilions was built between 1710 and 1734 by Maharana Sangram Singh for the ladies of his court. It gave the queen and her friends a place to relax, far from the political intrigues of the court. Neemach Mata temple is perched at 800m above sea level on a hill just by Lake Fateh Sagar, with steps up the hill to reach it. It is dedicated to the Hindu goddess Neemach Mata Devi. One can have very beautiful view of whole city and its lakes from the temple as well as while climbing. 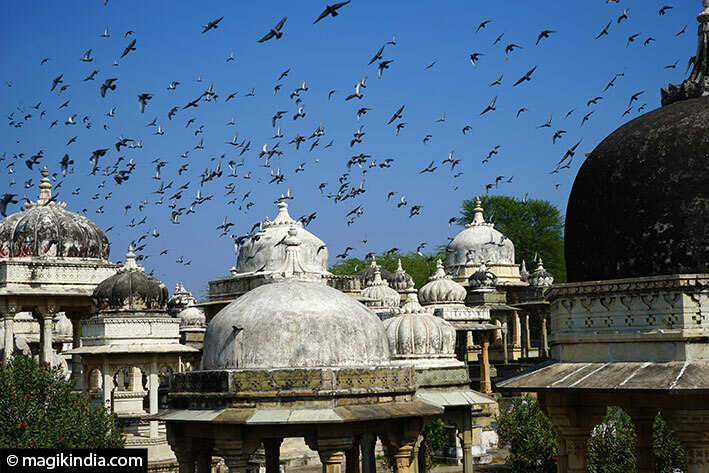 The Ahar cenotaphs are located 2km east of Udaipur. The site has definite charm. There are more than 250 cenotaphs of Mewar royals here, built over a period of 350 years. The cenotaph of Maharaja Sangram Singh, cremated here with all his 21 wives, is among the most interesting; it boasts 56 pillars and an octagonal dome. The Monsoon Palace overlooks Udaipur from the top of a hill. It was built by Maharana Sajjan Singh (1874-1884) as a place to watch the monsoon clouds. It offers a panoramic view of the town, the lakes and the surrounding countryside. Especially good at sunset. 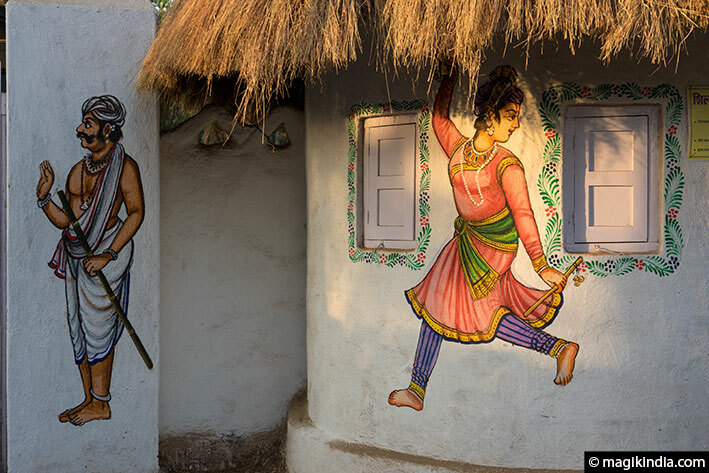 Shilpgram, a crafts village 3 km west of Lake Fateh Sagar, has displays of traditional houses from Rajasthan, Gujarat et Maharashtra.There are also demonstrations by musicians, dancers, or artisans from these states. 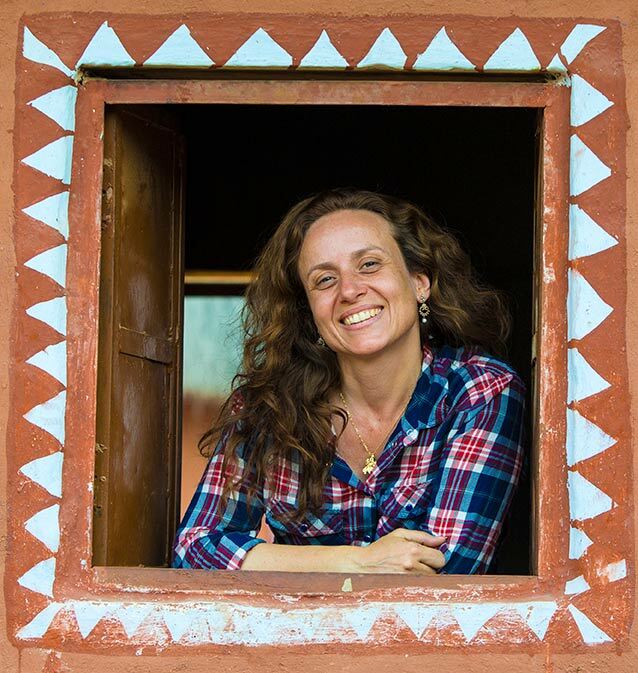 The 10 day festival organised here in December is a treat for the visitor to an array of exquisite art and craft. These beautiful twin temples dedicated to Vishnu were probably built in the early 11th century CE. “Sas” is short for Sahastra-Bahu, which means “He of the thousand arms”, a particular form of Vishnu. The larger temple has ten shrines around it and the smaller is a Panchayatana (i.e. has five shrines). Both temples are finely carved with friezes of the Hindu gods Brahma, Vishnu and Shiva and the avatars Rama, Balarama and Parashurama. 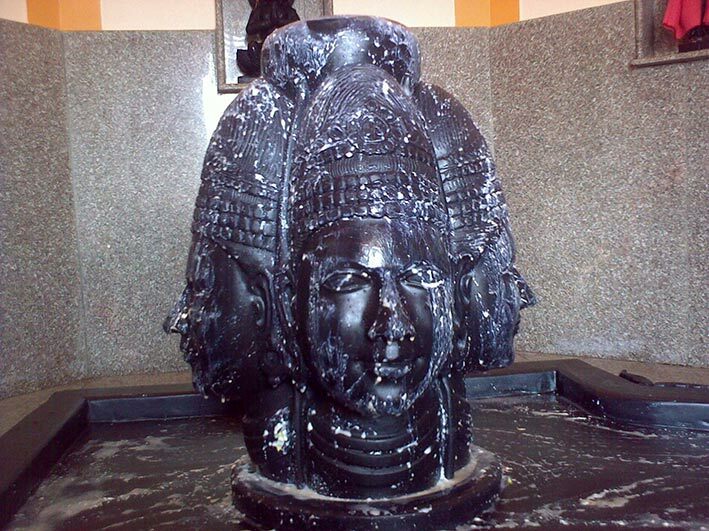 Eklingji temple complex, in Kailashpuri, 22km from Udaipur, is dedicated to the Hindu god Shiva.It is famous for its 108 shrines surrounded by a high fortified wall.The idol in the inner sanctum is a lingam composed of four heads carved in black marble. Eklingji was the deity of the Mewar rulers from the reign of Bapa Rawal (734-753), founder of the dynasty and builder of this temple. He is said to have received a religious education from the sage Harit Rishi who meditated in a cave nearby. Several of the Mewar Maharanis rebuilt or renovated the temple. 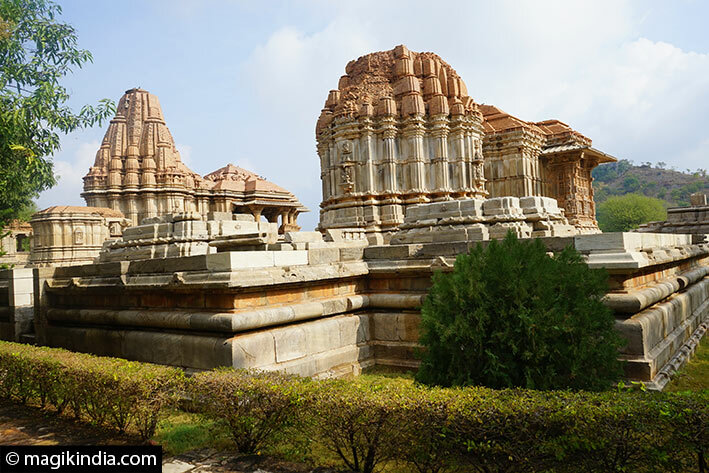 A little way past the Eklingji temple complex is the small town of Delwara. Few tourists know it, but it is called the “town of the gods” because of the 1000 temples it once boasted. Even today there is a temple in every street. It also boasts the Devi Garh luxury hotel (a converted 18th-century palace), a fine stepwell, some Jain temples and local handicrafts. The town itself has a certain charm. Rakta Talai or Khun-Ki-Talai is a plain near the town of Nathdwara where the Rajput and Mughal armies fought the bloody Battle of Haldighati in 1576. The Rajputs won, but so fierce was the fighting that the battlefield was littered with corpses. Chhatris, or cenotaphs, of courageous warriors such as Shah Tanwar of Gwalior and his three sons were built here. The Maharana Pratap Museum tells the story of the Battle of Haldighati, when Maharana Pratap Singh, son of Maharana Udai Singh, fought the Mughal emperor. An animated film in Hindi shows the different stages of the battle. It is said that Pratap Singh fitted his horse with an elephant trunk to deceive the enemy.